LEEF has announce the launch of an exploratory workshop series: Shaking it up! EE revolution in our schools. The workshops are co-ordinated by Poppy Flint and members of the Environmental Education Research Group at King’s College London [KCL] and are inspired by the two reports published by KCL last year on Understanding Environmental Education in Secondary Schools in England. They will explore the question What’s next for EE in our schools?. The first session will be held during the LEEF Discussion Evening on Wednesday April 3rd at KCL in Waterloo. You can register here. The Foundation for Environmental Education (FEE) published Positive Actions for the Sustainable Development Goals last November and is now inviting teachers participating in the Eco-Schools programme, to develop and submit lesson plans that promote an action oriented pedagogy about specific Sustainable Development Goals (SDGs). The submission deadline is July 2019 and the details are here. 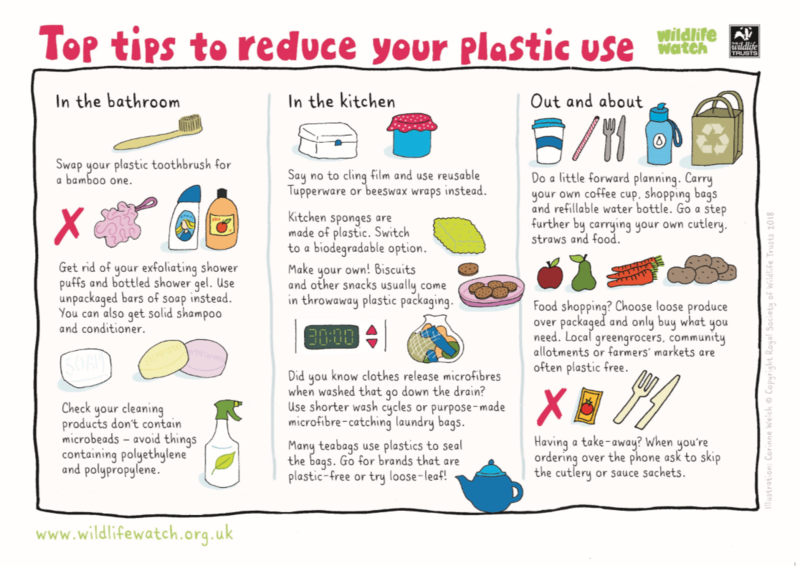 Wildlife Watch has advice on ways to cut down on plastics use that you can download. The Climate Coalition is the operating name of the Climate Movement, a UK charity. It says: “From sports and nature to faith and international development organisations, here at The Climate Coalition we represent a diverse group of people across the UK. But in spite of our varied interests, we are all unified by one thing: we passionately want to protect the things we love from climate change.” There is more detail here, and here. A recent Circle of Life Rediscovery blog post said that whilst the term nature pedagogy might appear new, humanity’s most ancient and biologically responsive blueprint is to develop a “deep nature connection and understanding” about how our needs and interests can be met successfully though nature to provide a meaningful contribution to our lives. There’s more detail in the post, and other blogs can be found here including one from Katie Scanlan on activity ideas for Forest Schools in urban spaces. For more information and to book your place visit the FEN events webpage. The Coral Reef Alliance annual report is here. It contains stories about the Alliance’s three strategies and how it’s designing and implementing conservation programmes, forging partnerships and advancing the science of coral adaptation. There are spectacular photos and videos of coral reef ecosystems. The Nature Connections 2019 conference will be held at the University of Derby on July 2nd 2019. This aims to share the latest research evidence on the links between nature connectedness, well-being and pro-nature behaviours. Key themes will include Nature Connection in Practice / Policy Making / Age. For submission and other details see this. The submission deadline is April 28th. A reminder that Outdoor Classroom Day (a global campaign to celebrate and inspire outdoor learning and play) is on May 23rd this year. In 2018, over 3.5 million children worldwide took part. Full details here on how to get involved, including a map of those involved so far.